Modern heat-treatment processes are constantly making new demands on quenching fluids. PETROFER’s extensive development program ensures that our product range is more than capable of meeting new industry advances. We are constantly screening new materials for their suitability for our formulations and our existing product range is continually reviewed to ensure that the best available technology is used. Petrofer’s product range for heat treatment provides our customers with a complete portfolio for the whole range of heat-treatment processes. 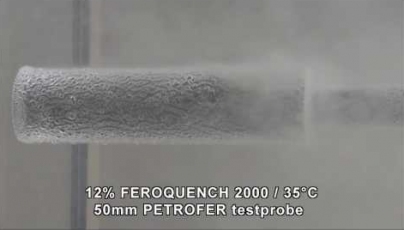 Petrofer manufacture every type of quenching oil, from simple quenching oils for hardening high alloyed steels all the way through to accelerated quenching oils for achieving maximum hardness depth in low alloyed or plain carbon steels. We also have water washable versions of almost all of our quench oils available as well as specialist synthetic (mineral oil free) biodegradable quenching and tempering fluids. All of our quench oils share a common trait, they are manufactured with the best quality additives to ensure low oxidisation, (best resistance to ageing) and minimal evaporation. Innovative water-based and conventional solvent-based protective paints for protection of parts from many heat treatment processes. Our range includes products for protection from gas carburising, gas nitriding, plasma nitriding, vacuum heat treatment processes and brazing. After treatment is completed residues of the protective pastes are removed easily following treatment: either in aqueous cleaning solutions or mechanically. Petrofer were the pioneer of polymer quenching technology, originally developed to provide controlled and safe quenching, which bridged the gap between properties achievable with accelerated quench oils and water quenching. Mixed polymer quenchant solutions have no fire risk and in certain heat treatment processes our products are able to replace accelerated quenching oils. In recent years Petrofer have further developed the polymer quenchants range to include products which are free from boron and formaldehyde releasing biocides. Aquacool products are often used where a high concentration of Aquatensid would have been required to give the desired heat treatment properties. Typically, this would include induction hardening or tank quenching of high alloyed steels. Heat Treatment Salts have been manufactured by Petrofer for decades and we are now one of the few remaining companies globally that still offer a wide range of products to suit most salt bath heat treatment processes. Salt baths have many advantages including: cost effective treatment, low distortion, uniform temperature distribution and short treatment times. Our product range includes salts for hardening, quenching, austempering, carburising, heat transfer and rubber vulcanisation. Salt Baths for quench and tempering, martempering annealing and austempering. Salt Baths available in working temperature ranges from 680 – 1100°C, used in conjunction with a rectifier (NEUTROSAL) to prevent decarburisation for case hardening and pre-heating of quench and temper steels. High temperature salts for the hardening of high speed and tool steels. Sinoxal salt baths are easy to maintain and have exceptional protection against decarburisation. Marquenching and tempering salts for high-speed steels and tool steels. Stable, one-salt carburising baths, easy to operate and particularly economical. Petrofer are the UK agents for Delamin cyanide free Salt Bath Nitrocarburising (SBN) products. The nitriding salt, Delnite is used in conjunction with a regenerator Delgen and offers a high quality cost effective alternative salt bath nitriding (Ferritic Nitrocarburising) process. Petrofer are suppliers of high quality quench salt often used after nitriding giving the quenched parts a high quality corrosion resistant black finish. Hot chemical blackening salts are mixed with water for cost effective blackening of iron and steel components. Normally operating at temperatures around 150°C, Petrofer’s products are highly efficient and can often eliminate the need for 2 consecutive blackening tanks. Nitrite-free and nitrite-containing salts used in rubber vulcanisation baths and other heat transfer processes including solar energy conservation. High quality products ensure low melt temperatures and molten viscosities for efficient heat transfer process.